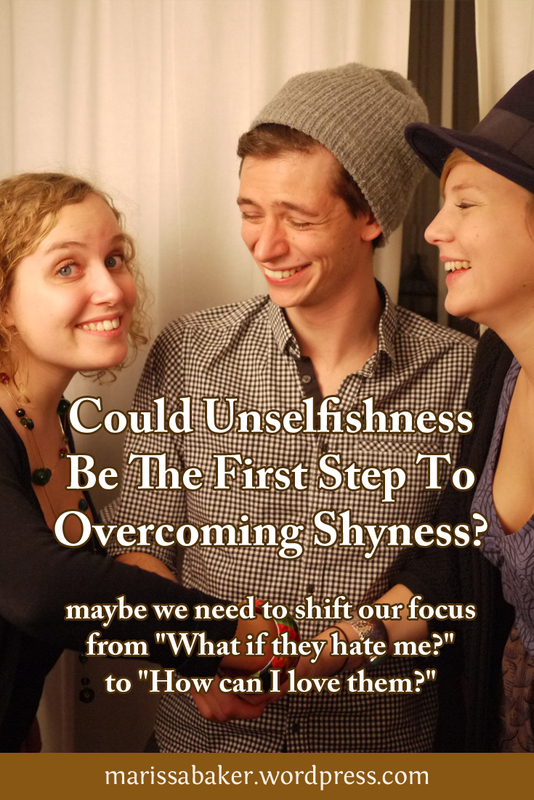 Could Unselfishness Be The First Step To Overcoming Shyness? It would probably come out more as a squeaky “Hi” followed by awkward silence as I frantically tried to come up with words resembling normal small talk. *sigh* So much for INFJs being “the most extroverted introvert.” Perhaps some INFJs are, but I’m not. I’m shy. I thought it was getting better, but apparently I still need more work battling my social anxiety. Despite Google’s antiquated definition of introvert as “a shy, reticent person,” shyness and introversion are far from the same thing. “Shyness is the fear of negative judgment, and introversion is a preference for quiet, minimally stimulating environments” (quote from “Are You Shy, Introverted, Both, or Neither (and Why Does It Matter)?” by Susan Cain). Shyness produces anxiety in social situations, while introversion means you lose energy when around other people. The traits often go together, but extroverts can also be shy. Introverts who aren’t shy still prefer the inner world of thoughts and ideas to the outer world of people and things, but they’re capable of socializing and even enjoy it. Extroverts who are shy want to spend their time in the outer world, but they’re scared of people. Now, I know you can’t just snap out of social anxiety (which is an extreme form of shyness) by thinking of it as selfish. That’s just going to lead to feeling guilty about something that’s a real struggle. But perhaps shifting the focus away from how our fears make us feel is a first-step to overcoming the type of nervous shyness that makes it hard to meet people. Confession time: I can walk up and talk with people who are older than me. I can introduce myself to other young women. But when I try to start a conversation with a guy close to my age? I’m still just as awkward as I was 10 years ago as a shy teenager. Maybe this is why I say I like extroverted men — they’re the only ones I’m likely to meet because they’ll introduce themselves and keep conversations moving long enough for me to get comfortable talking with them. This past Sabbath after coming home from church, it really hit me that I’d done something wrong. Not by being shy, but in letting it control me and even using it as an excuse to be rude. Because that’s what it was when two young men visited my church and I didn’t even say “Hi” as we were standing next to each other in the potluck food line. These thoughts are all focused on how I negatively perceive myself (and therefore assume others will perceive me). They have been reinforced by some people, but those incidents are much rarer than my anxiety wants me to think. I need to love and accept myself, then get over focusing on myself, if I want to bring my best and most friendly self into meeting new people. Usually when I think of selfishness I think about people who obnoxiously insist life’s all about them. But I’ve done that exact same thing in a quiet way. Even though I’m shy instead of arrogant, the focus has been on how I feel and how I think others look at me. I know I would be a better conversationalist if I focused more on how I can make the other person’s day better than on how awkward I feel starting a conversation. I’ve had glimpses of what it’s like to feel confident when meeting people, but it’s far more rare than it should be. I believe it’s time to let go of all that worry about how others will see me and just be genuine while focusing on getting to know the other person. And I hope you can join me in that. I don’t mean to make this a “you should feel guilty about your selfish shyness” type of thing. I’m shy; I know what it’s like. I know we’re not trying to be shy and it feels like something you can’t help. But I also know I don’t want to feel crippled by my insecurities. If taking my eyes off myself and setting them on loving the people around me (in a non-romantic sense) will help, then that’s what I want to do. Actually, that’s what good people do, not just ones trying to overcome shyness. My relationship with the Body of Christ changed dramatically when I stopped looking at it as how are they interacting with me – they did or did not say hi, they did or did not invite me to something — to just how am I helping them. People, even church people are messed up and often broken and just dying for someone to put self aside and show love to them. Jesus came not to be served but to serve. I was super shy, not introverted, great distinction that I did not really get until this article, but now I force myself to talk with anyone I can even if it is super awkward. If we realize just how much people need each other in the church it gets easier – or that is what I have experienced. My wife is an introvert and has been dealing with this since becoming a pastor’s wife. Projects negatively on people – they are going to sin when they speak with you. It is not hoping all things and believing the best in others. Not condemning at all, I just had never realized that as I struggled with people. Wow. I hadn’t thought about that aspect of anxiety being unloving toward others. But that is what I’ve been doing — projecting negativity onto people instead of hoping and believing the best. I guess that’s something else I have to think about in trying to focus more on loving my brethren. It’s not just how can I help them, but also assuming good things about them (like I’d hope they would assume about me). Thank you for this post! Just this morning I was regretting that *once again* I had very little conversation at church yesterday. I tell myself that next time I’ll make more of an effort, but then rarely do–even with people I especially like. Large social settings are overwhelming and I shut down. Most of your concerns when conversing are mine for myself, too. I’ve become much less insecure (after learning what the root of it was), but still struggle. I’m encouraged that you wrote this. I hope I’ll remember it in the future and not forsake fellowshipping with my brothers and sisters in Christ. Seriously, this topic was weighing heavily on my mind this morning. What a blessing to then read this post! You’re welcome 🙂 and thank you! I hoped when writing this that it would helpful to others as well as myself. Thanks for sharing that article. I’d seen in on Facebook a few days ago and the title came to mind while I was writing this post, but I didn’t track it down or read it until just now. Guess I’m not the only writer realizing I’ve taken permission to be an introvert to a selfish extreme.